The grey look on this wooden floor sanding Bury st Edmunds project by spraying it with water. Were getting a few enquires about the grey look on wooden floors as this look is quite fashionable at the moment. Here is a look as how we achieved this on this floor sanding Bury st Edmunds project. On this beautiful solid wood french oak floor once fitted. We floor sanded with an 80 grit to remove all lips and marks. Being a rustic grade the knots were also filled. Sometimes we don’t fill the knots as customers like to see them and sometimes we fill them like in this case as some of the knots were quite large. The floor was then sanded using a dustless sanding called a lager Hummel . This machine gets amazing results on it’s own, but for a more even better result a lager trio was used to finish. With it’s 100% dust extraction and three discs on underneath which all rotate in different directions this machine gets the best possible results bar none. Spaying the wooden floor with water. With the sanding process you have to finish with at least 120 grit to avoid any swirl marks that may show. 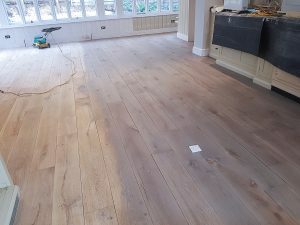 This is quite smooth and will not allow the stain or oil in this case the grey oil to penetrate into the wooden floor. A sprayer was used to lightly mist the floor with water to open the grain of the wood called “water popping”. This opens the timber up allowing the colour to penetrate. Now water popped and allowed to dry a coat of oil was buffed into the floor using a orbital machine with an nylon pad on. Once dry and being in a kitchen we needed something hard wearing to protect this floor. So a two pack hard wax oil was used with an ultra matt finish. So thats it on this floor sanding bury st Edmunds project. 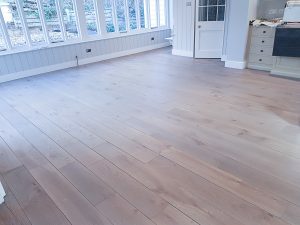 If you would like a quote or a chat on any of your floor sanding requirements please click here. ← Wide plank wood flooring and the right floor sander for the job.